Buying the right gift for your dearly beloved is a tall order. You want to get it right and avoid any disappointment. Read our guide and get some ideas on how to hit the mark first time. Perfume underwear and candles are all stock gifts that you can give your wife. She will appreciate them and will be pleased but the element of surprise will not be there. These should be your last resort ideas, called upon only when any other avenue fails. Keep these in the back of your mind and use your imagination to find innovative alternatives. Buying clothes for your wife is a high-risk gift. For instance, that jumper you thought cosy, might be seen as frumpy by your nearest and dearest. And if you buy the wrong size be prepared to beg for forgiveness. A much better idea is to buy an item that only comes in one size and which fits all – a handbag. This is a great gift idea: your wife will be thrilled and there is bound to be a version to fit your budget. These days you can spend anything from £20 - £750 for a top quality leather handbag. Think about her favourite designers and head straight to their flagship branch for the widest selection. Shoes are much the same as handbags - they always fit and they are always welcome! Go for a glamorous style that she might never treat herself too. Head to Jimmy Choo or Gina if budget allows, otherwise the top-end of the high street stores have some impressive accessory ranges that will make her very happy indeed! If your wife has a stressful job, has to look after your children all day or has to juggle both responsibilities – plan a break away. This is a fantastic gift - planning is required to secure day’s off work and arrangements for the kids – but the payoff is well worth it. Explore the sites of web based holiday operators. They have great deals and destination ideas. If you are taking her away for a couple of days, keep the trip local and within Europe. Barcelona, Rome, Budapest, Stockholm or Madrid are cities packed full of cultural sites and shopping opportunities. Thinking about going away for longer? The choice is yours – a package trip to a Spanish sea resort or a luxury stay in the United Arab Emirates are both viable options. When you present the trip to your wife, don’t just hand over the tickets. Buy a suitcase or weekend bag and stow the tickets inside and give her a real surprise! If a few days away are really out of the question, make time for just one special day out. What could be better than a pampering session? And why should you miss out on all the fun? These days’ spas cater for his and her treatment sessions and have rooms especially for couples. Have a massage together or uplifting facials. Not only does your wife get a relaxing day out but you get to spend quality time together – it’s a win-win gift idea and that will make both of you happy. Mortgages and families sometimes drain financial resources. Diamonds from Tiffany’s might be out of the window but that doesn’t mean that you can’t treat your wife to a day to remember. Sometimes the simplest gifts can have the most powerful impact. Send your wife out for the afternoon. 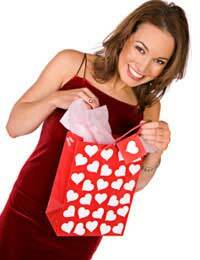 Get her a voucher for a manicure or pedicure at a local salon and whilst she is out, get busy around the house. Ease the burden of her chores: vacuum, dust and make the place spotless so that she can put her feet up. Then start preparing a romantic evening meal with all her favourite dishes on the menu. Light candles and set the table for a special evening in. When she walks through the door she will instantly recognize the effort you have made and will be very happy. When buying a gift for your wife make sure you get something to remember. It doesn’t have to break the bank – simple, loving gestures go a long way to impress and delight.